The owner of this Victorian terrace house in Kensal Rise, north London, is a set designer and so has an eye for the theatrical. 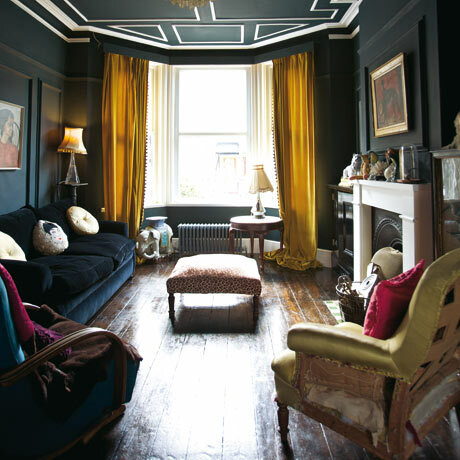 Jo Kornstein has painted her living room walls Black Blue from Farrow & Ball – and that includes the ceiling – giving the room intense drama. "It gets a lot of light, so it could take a dark colour," Kornstein says. "In winter it's cosy and in summer it's surprisingly cool." She kept the 60s ceiling cornice white and injected mustard, cerise and aubergine shades into the room with velvet and satin fabrics. The curtains are from antique fabric and pool elegantly on the floor for extra opulence. The black velvet sofa is from Sofa Workshop. "Not everything is vintage," Kornstein says. "New sofas are much more comfortable than antique ones. When I buy new furniture, I try to look for traditional shapes." The pair of pale, buttoned cushions are from Laura Ashley; for other accessories, she has scoured markets and antique shops, looking out for Victorian artefacts such as china figurines, bell jars, taxidermy and oil paintings. 'I wanted to avoid a cold, sterile room,' Kornstein says. 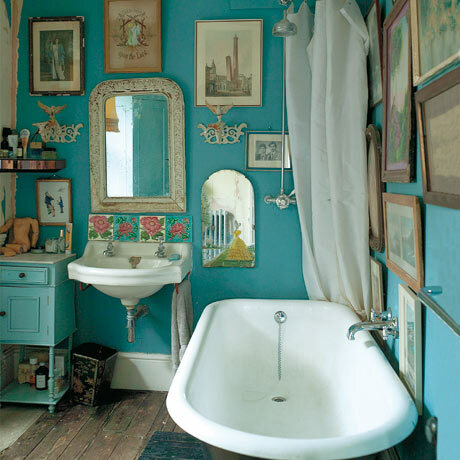 The bathroom is a gloriously feminine, mismatched space. "I wanted to avoid a cold, sterile room," Kornstein says. It's filled with prints and photographs – the collection grows, piece by piece – distressed furniture and scuffed vintage mirrors, their surfaces showing the patina of age. The makeshift splashback of tiles was brought back from Cochin in Kerala, India, and was the starting point for the colour scheme (Aqua from Zoffany Paints is a good match). The lighting is deliberately low: "Everything's on dimmer switches." 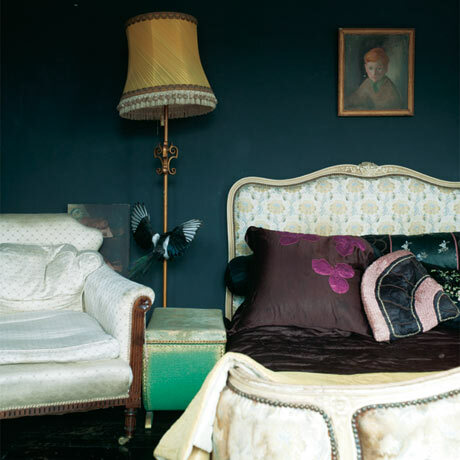 The master bedroom is painted Off-Black by Farrow & Ball, but gets a strong sense of colour from bright, vintage accessories. Like the living space below it, it's a light room. Here, the faded furniture is mostly vintage and tightly packed to give the space the air of an antiques emporium. A tasselled lampshade and satin throws on the bed lend the room its boudoiry feel. Bright porcelain figurines found in car boot sales line the mantelpiece. The kitchen is the darkest room in the house and faces north,' Kornstein says, 'so we tried to make it cosier by using lots of wood – it’s warm and inviting.' The kitchen is stripped back to its bones: exposed brick, salvaged wood walls, and naked beams and pipework on the ceiling. The floorboards are varnished. "The kitchen is the darkest room in the house and faces north," Kornstein says, "so we tried to make it cosier by using lots of wood – it's warm and inviting." 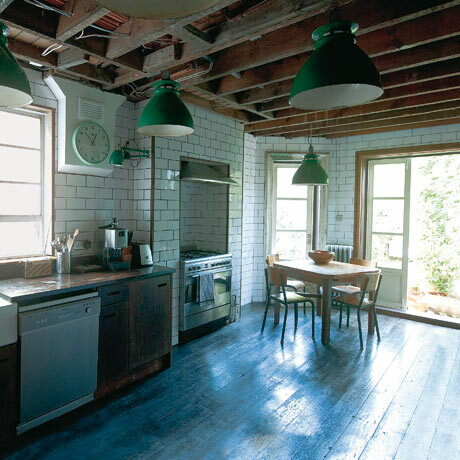 Racing-green factory lights (try trainspotters.co.uk), reclaimed laboratory worktops (try lassco.co.uk) and utilitarian, metro-style white tiles right up to the ceiling add a more functional look (brick tiles are widely available from DIY stores). The units are one-off, freestanding: "We wanted to get away from a fitted kitchen look," Kornstein says. This flat is amazing! I love all the little details. I love the ceiling. Beautiful! 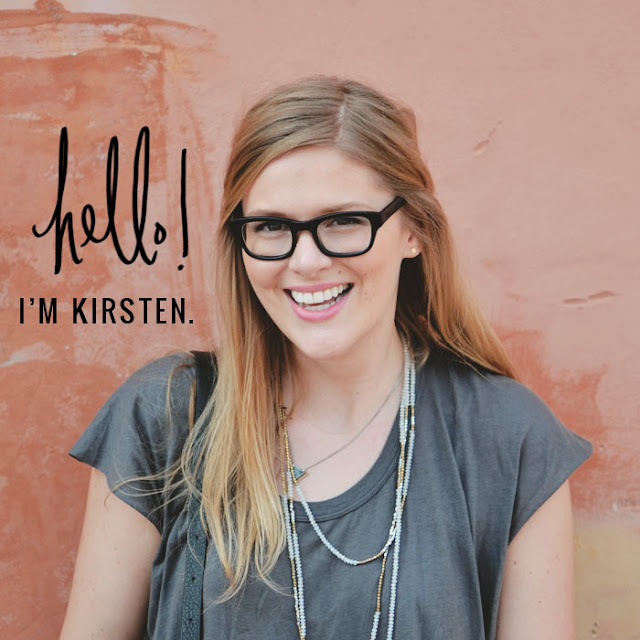 the patina on the floors is amazing- so rich and inviting. Sometimes aging is beautiful.